Two halves make a whole. 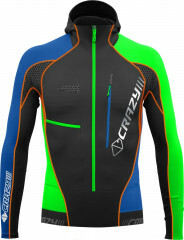 The Repeat race jacket from Crazy Idea can be snapped together with the matching pant to make a full suit. The fabric is PowerKler, the same stuff found in the Crazy race suits that is smooth to the touch and might make you younger. But now you can enjoy your race-efficiency with or without pants. The Repeat top has two stomach stashes that you access by zipping upwards. It also has a bottle/flask holder on the skier’s right side for quick access to liquids. For skins, the Repeat has a zippered outside pocket on skier’s left which will fit some low-fat mohair. Crazy Idea even added a nice elastic hood, a bonus feature as compared to the suits. Net result is a very flexible solution to your race-attire quandary. Supple PowerKler fabric contains minerals and resists bacteria. Flatlock seams meld with the smooth fabric for a true athletic fit. Zippered chest pocket fits small skins or other items if you stuff your skins inside. Half-liter bottle holder on the chest is one less feature for your pack. Inner beacon pocket means you don’t need to carry a bulky harness. Two stomach pockets are great for gels, bars, clinometers, etc. Excellent Italian styled race top. I'm short and stocky and a size medium fits well, so no excess in the sleeves and the waist does creep up under the pack waist belt but doesn't hang down lower than desired, this wouldn't be an issue if paired with the pants (which I haven't done). The pockets are nice but are all on the smaller side, the water bottle pouch seems like it will only fit a smaller soft flask or smaller than typical water bottle, the inside zippered pocket I just recently discovered would possibly fit one of the newer small transceivers but not my barryvox pulse. The fabric is warm and comfortable. The hood is slim and tight fitting but stays put on my head but if I were to need it with a helmet it will only fit under the helmet. I'm not sure how durable this will be, some of the stitching on the seems is already coming loose but that should be easy enough to fix. Overall this is a super nice race top that keeps the essentials close at hand and while just the right fabric weight for the up I often throw on an additional jacket for the down. Cons: I personally wish all race suits had windproof panels on the front like the Dynafit Radical race suit or the PDG pant. The back isn't ventilated. I feel like the hem of this top creeps up under the waist belt more than I would expect, despite a silicon coated elastic at the hem. I feel that a race suit will keep you warmer and give you more protection if you eat it on the down, but if you're only one foot in to the race scene, a two piece suit is a good compromise. 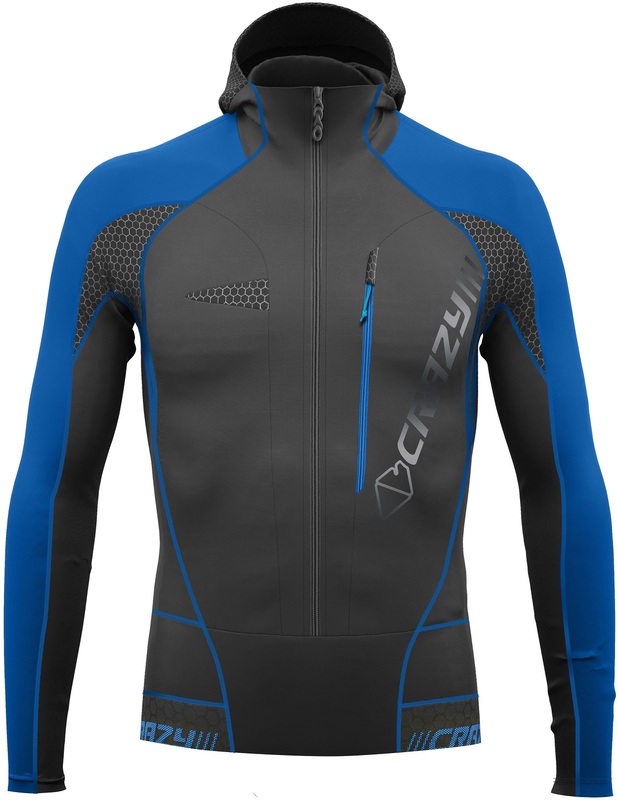 In general I've liked using this top and its bottom counterpart on training days in the morning at the resort paired with an upper layer (Dynafit Mezzalama jacket is nice) and the Mezzalama short for the descent. The PowerKler fabric weight offers enough protection from the wind on the up, but on a cold morning the cold on the descent cuts through, hence the pairing. The top zipper has a nice long rubber tab on it, but it's black which makes for a difficult contrast with the suit itself. I wish the tabs were the color of the contrast color (i.e. blue or orange) but that is easily fixed with electrical tape. The bottom zipper pull has no tab on it so you'll have to fashion your own if that is your thing. 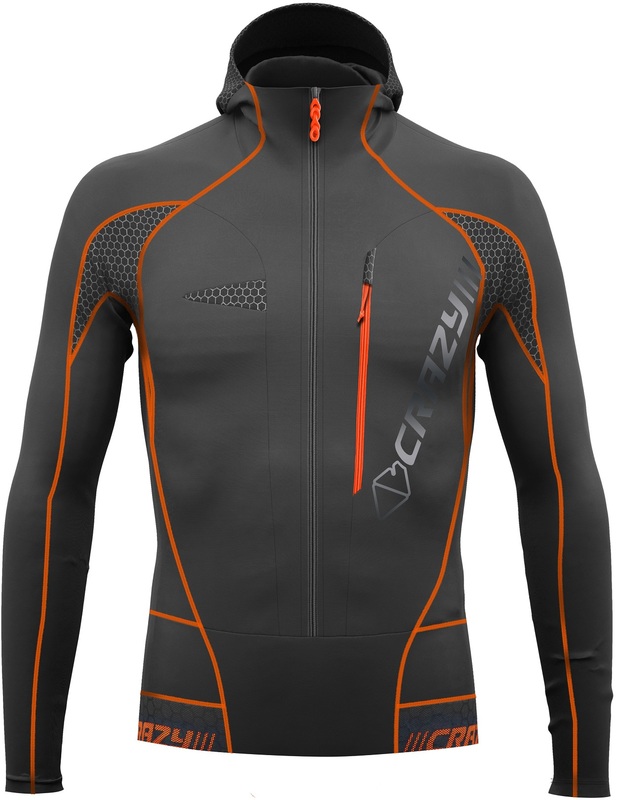 The zipper pocket is spacious and can fit race skins pretty easily. The water bottle pocket is nice but sometimes is awkward to manipulate something into if the top is unzipped at all. There are no inner zippered pockets on the model year I purchased, so if you're looking for an ISMF race legal suit, this won't qualify. Maybe that is no longer true in the newer colors/models? I'd say it shines as a piece for the adventurous tourer who wants to do some racing but wants to really learn how to apply race logistics to doing bigger days. The two piece nature gives you the efficiency of a suit, but the options to break down into functional parts. I.e. Use the top on your tour but pair it with a more substantial pant or use just the bottoms as your base layer on the lifts so you get full gaiter coverage. Hi Greg, thanks for the feedback. FYI the 2016/17 version does have a zippered internal pocket. It's pretty small though, so can only comfortably fit small beacons (e.g. Pieps Micro). But it would be race legal if you have a beacon in there. Wondering how the sizing is on these. I'm 5'10, 165# and skinny but not tiny. I would usually wear a medium in performance clothing, but some of this Euro stuff can be pretty tight. Would like it to be form fitting but not super tight. For comparison, I can fit in a medium performance cut cycling jersey, but usually prefer a large. Hi Jack, sizing is Euro so these are fairly tight. You could go either way, I'd check out the large based on your preferences. doing the elk mountain traverse. clothing? race suit? Hi Jon, a race suit will make you faster and more personable. It's nice to have everything you need in your kangaroo pouch so you can focus on racing and conversation. 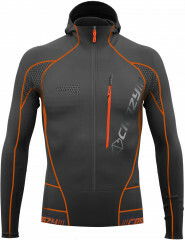 The Repeat is a two piece race suit, but otherwise has the same functionality. Be prepared with your extra layer if it's cold overnight though. Race suit all day for the EMGT! What is 1 + 11?